Technology, writing, gadgets, gizmos, and the stuff of life that makes it interesting! Miles looked up from his phone in just enough time to see the car that was going to kill him. He gripped the phone tightly—he was standing in the middle of the road and needed something to hold on to. Also, he paid a lot of money for that phone and wanted to protect it. It was a gift to himself from his annual bonus. He worked hard; he deserved it, but he couldn’t afford another one. If I die, then Emily can use my phone. Hers is so old. I’ve asked her a million times to get herself a new one but she hasn’t. She’s always so stubborn about it. If I can just protect the screen from shattering, then she can use it. Do you think she will? Probably not. It will remind her of me, and she’ll refuse to turn it on. She’s so sentimental. What a waste of a phone. I’ve only had it for a few weeks. The car’s fender inverted his knee and Miles doubled over. The three protective shields of the Buick logo plowed into his groin. At least it’s American. I’d hate to get run over by a Japanese car. They’re everywhere. Cheap imports are killing the economy. We have to do something about that. Anyway, weren’t we at war with Japan not too long ago? Now we buy their cars? I guess there’s a dying minority of patriots who still refuse to buy them. The irony is that all those American war films are probably shot using Japanese cameras. The Buick’s hood scooped him up and rolled underneath Miles at tremendous speed. There’s dried bird poop on this car. That’s disgusting. Doesn’t the owner ever clean this thing? That reminds me, I need to wash my car. I probably won’t ever get to wash it again. I knew I should have done it yesterday when I had time, but I was too lazy. Maybe it's time I listen to the advice I give the kids: never waste an opportunity. Well, yesterday I had the opportunity to relax and do nothing, so I was kind of taking my own advice. Someone else will have to wash the car now. Emily won’t do it. She’ll probably pay some kid down the block to wash it, or worse, she’ll take it to a drive-through. I hate those things. The car never gets a proper clean, the pink, gluggy soap they use smells something terrible, and I’m sure the rotating brushes scratch the paintwork. Miles tried to lift his arm to protect his head. He glimpsed the driver’s white knuckles on the steering wheel, and smashed into the windscreen. It didn’t quite give way, but Miles left a spectacular impact where his elbow and shoulder slammed full-force into the glass. Man hands. The driver is a man. Or a woman with man hands. Probably a man. What was that statistic? Oh yeah, 5,000 pedestrian deaths a year in the US. Imagine that, 5,000 people every year get up in the morning, perfectly healthy, drink their morning coffee and then, boom, dead before reaching the other side of the street. Did I have a coffee this morning? Miles’ body splayed out in mid-air and smacked down on the edge of the car’s roof. The trees flipped over and the sky was where the ground should have been. He felt the metal roof depress uncomfortably under his weight. His back cracked. How is that woman’s handbag suspended in the air like that? Is she upside-down, or am I? Oh, look, she dropped her papers and they’re blowing all over the place. She’ll never find them all again. That’s so inconvenient. I hate it when that happens. Maybe the papers were important. Maybe it was her PhD thesis, or the manuscript for her first novel. Nah, that’s ridiculous. Nobody prints manuscripts anymore. She would be carrying it on a disk-on-key, or have it saved on the Internet somewhere. Everything is digital. Why do we even need bags? The gushing air suddenly calmed and Miles descended quietly through it. The Buick fishtailed elegantly past, its tires leaving inaudible skid marks behind them. This is just like when I was a kid and built ramps for my bike using a couple of old bricks and a plank of wood. I’d ride really fast up the ramp and fly off the other end. Being completely airborne even for that one moment was freedom. This is that feeling. Hey,where’s my phone? Oh no! I dropped it! Maybe they’ll find it. Will they still be able to identify me without it? Do I have my wallet? I don’t remember putting it in my pocket this morning. Is it still on the dresser? There’s $100 in there for Emily. She asked me to take out some cash, but I forgot to give it to her. I should have given it to her when I had the chance. She’s not going to be happy with me when I’m dead. Yes, I know it was my fault. Just because I didn’t look up at the right moment I’ve become a statistic on an Excel spreadsheet, saved to an aging PC in a joyless, grey government office somewhere. I’m a pie chart. The blood had barely started to pool around Miles’ head before the woman with the papers reached him at full gallop. She gesticulated wildly while yelling into her phone. That’s funny, I have the same phone. Wait, that’s not mine, is it? No, mine’s black. Hey, can you call Emily? I think she has a similar handbag, but she has so many, who can keep track? She’ll want to know where I am. We were supposed to have dinner tonight at a restaurant to celebrate something, I forget what. That’s why I was looking at my phone when the Buick hit me. I really liked that phone. If you can find it, that would be great. The woman bent down over Miles. She turned frantically to the gathering crowd and shouted something. Look at all these people. Lots of brown and black shoes, but not many other colors. I wonder what’s more popular, brown or black? I always wanted a pair of brown shoes, but black is more practical. I only have four pairs of shoes: a black pair of day-to-day shoes, a pair of dark-blue hiking boots, my running shoes (also black), and sandals - black. I can’t really justify buying another pair of shoes. If I did buy a brown pair of shoes, I’d have to make sure that I have the right pants to wear with them. Not everything goes with brown, right? The ambulance arrived. The woman with the papers backed away. Miles lay motionless and his head was angled awkwardly to one side. His eyes were half closed. His mouth was half open. The paramedics knelt by him and searched for signs of life. Hey, buddy, can I get up now? Listen, I’ll be okay. Give me a couple of day’s rest and I’ll be back to my old self. Really. I promise not to use my phone while crossing the road again. Deal? Can’t you just let me go home? I’ll chug down a well-aged scotch or two, take a long, hot shower, and all’s well that ends well. What do you say? I guess you don’t get hit by a poop-covered Buick, driven by a white-knuckled man-hands driver and live to tell the tale. I’m kidding. Come on, seriously, that’s for other people. We’re talking about me, here. Dennis took a step towards the curb. The mildly bitter after-taste of coffee luxuriated on his palette. The sunset cast a quiet glow over the high-rise buildings. The cars pushed softly through the orange shadows on their way home. He loved this time of day. He usually didn’t work the night shift, but he agreed to cover for Will at the last minute. Something about his brother being in an accident. The street lights flickered on and Dennis had just started to cross the road when a glinting object near the gutter caught his attention. As he bent down to pick up the phone, a calendar reminder for dinner with Emily slid onto the screen. Fancy that, I’m off to work and this guy’s at a restaurant enjoying his anniversary dinner. New phone, this. Nice screen. Dennis looked up from the phone in just enough time to see the Toyota that was going to kill him. 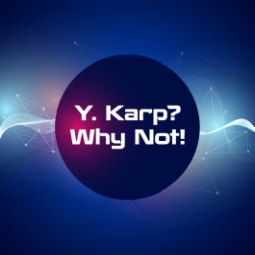 Subscribe to Y. Karp? Why Not! or follow on Facebook (see the side-bar). Add this blog to your RSS feed reader. Fantastic short story!...now where did I leave my phone? Support this podcast and help me keep going! See my previous blog, "Shtusim"